An eBay business is perfect for parents of any age. Especially parents of babies and toddlers since they have what seems like an endless stream of clothing, toys, and gear that becomes obsolete every few months. If you have a collection of baby items accumulating in your home that you no longer need, consider selling them on eBay to declutter your home and pass those gently used items on to another family who can use them. Not all used baby items should be sold online. Use caution when selling used baby gear including car seats, walkers, bed rails, gates, or any gear that is used for safety or restraint. Make sure all straps, buckles, latches, or other fastening items are in good condition and work properly. If a car seat has ever been involved in an auto accident, do not sell it. The US Consumer Product Safety Commission (CPSC) has a helpful guide called, "Resellers Guide to Selling Safer Products" that's a free download. "When in doubt, throw it out! Products used in the nursery, especially cribs and bassinets, have caused deaths and have been the subject of numerous recalls of millions of units. Do not sell any broken or wobbly nursery furniture or durable infant product that is missing parts, even if it has not been recalled. A baby’s life could depend on it. The risk is too high." Always check the CPSC website for recent recalls. Take the responsibility to verify that the product you are selling is safe - you don't want to be responsible for selling a product that injures a baby or child. The CPSC Recent Recall list is found at CPSC.com/recalls. Here is a list of six baby items that sell well on used condition eBay, are easy to ship, and either may be in your home or might be found at garage sales or in thrift stores. 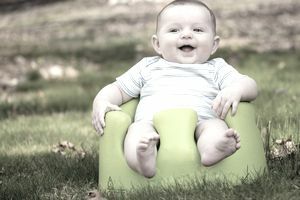 The Bumbo seat is a molded soft rubber seat designed to help baby learn to sit up. It is also great for feeding or playtime. For safety reasons, it must be sold with the waist strap. The seats sell well with or without the tray. Prices for the Bumbo seat in good used condition average $25-$30. This item is very easy to ship as it doesn’t break – just put it in a box, print the eBay shipping label, and you’re done. The accessories including covers, trays, and suction toys are also great sellers. Look for the Bumbo seat at thrift stores for between $1 and $5. Check out completed sold listings for preowned Bumbo seats on eBay. The Bobby is a circularly shaped pillow that fits around mommy’s waist so baby can lie comfortably while feeding. It also works for bottle-fed babies and promotes bonding and closeness between baby and parent. As baby grows, the pillow aids in different developmental stages including propping up, sitting, and floor playtime. The Boppy pillow retails for around $40 and sells in good used condition on eBay for about $25. The slipcovers are also good sellers and can sell for up to $20 depending on character, animal pattern, or color. $3 is a reasonable price to pay for a Bobby at a thrift store. JJ Cole is a line of stylish baby gear including stroller covers, car seat covers, diaper bags, carriers, and travel accessories. They are best known for the popular sleeping bag style stroller covers that come in original, urban, and polar styles. Retail prices for the stroller covers start at $39 for the original and go all the way up to $119 for the polar. Lined with a warm fleece inside, the Bundle Me keeps baby and toddlers up to 2 years old warm and comfortable when outside. Moms love this product because the baby can’t kick off the cover like with a regular blanket, but if baby gets too hot, just unzip the cover enough to make baby comfortable. The Bundle Me stroller cover sells for between $20 - $50 on eBay in gently used condition, depending on the style. eBay shows over 200 completed sold listings for the BundleMe in preowned condition. It may seem like a small amount. However, there are only 180 active listings, so these numbers indicate a niche market. Babywearing is all the rage now, and even more fashionable with upscale carriers, wraps, and slings. Tula products retail for up to $150 and have excellent resale value on eBay. These products are made from natural fabrics and in beautiful patterns. The custom-made Tula wraps can sell for over $500 on eBay in used condition. Tulas are durable, fashionable, and ergonomic. Moms like them because they aren't "crotch danglers" and won't hurt baby's hips. Check completed sold listings for pricing information, but most pottery barn items hold their value. Look for items like crib bedding, wool rugs, wall hangings, lamps, mobiles, window treatments, and wall décor. Bedding items sell well either in a set or individually, and bedding is easy to ship since it doesn’t break. The small area rugs can retail for over $500 and hold their value very well on eBay. Rugs are very easy to ship and are often overlooked at thrift stores, garage sales, and children's consignment sales. eBay shows 1,200 Pottery Barn baby items that sold in used condition. Baby items are great for resale on eBay since many new parents are on a budget and want the quality brand names but without the retail prices. Always disclose any flaws, stains, or defects both in the photos and written description, and check for recalls the CPSC website. Most higher end brands will sell even with a small flaw, as long as it isn't a safety issue. Always give full disclosure about any product you are selling on eBay.